Photo of Carnival Freedom cruise ship at the Port Everglades pier in Fort Lauderdale. The evening coastline in Charlotte Amelie St. Thomas. Taken from the departing Explorer of the Seas. Scanned from negative. 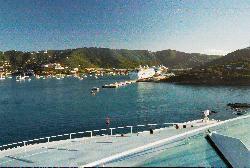 The Explorer of the Seas approaching the Charlotte Amelie port in St. Thomas. Scanned from a negative. 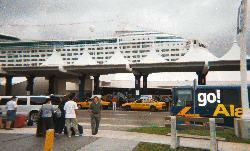 Disembarking the Explorer of the Seas at the Port of Miami. Scanned from negative.